Haroon Mirza, Standing Stones (Solar Symphony 8), 2015. Copyright of Haroon Mirza. Courtesy of the artist and Lisson Gallery. As part of the Frieze London 2015 programme, a series of new and historical works by international artists are currently on display in the Sculpture Park. One of the more contemporary pieces contributing to the Park, entitled Standing Stones (Solar Symphony 8), has been produced by ACS artist Haroon Mirza in collaboration with Mattia Bosco. 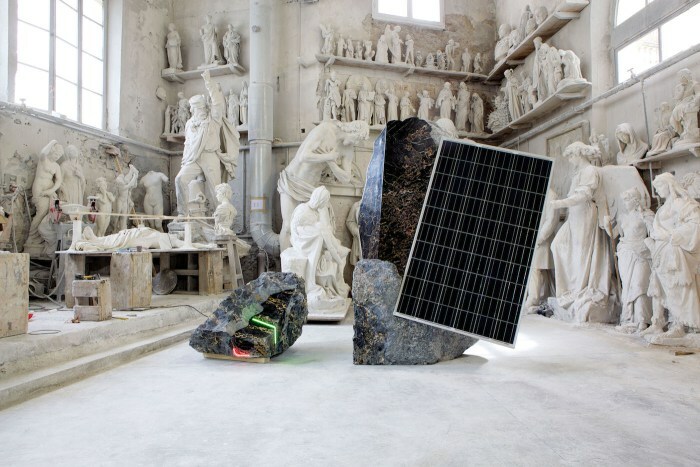 The sculpture, which references ancient celestial monuments, utilizes a large solar panel which has been embedded into a large slab of marble. In tracking the movement of the sun across the sky, the solar panel generates electricity which powers a series of LED lights and a loudspeaker. This innovative piece allows the viewer to perceive the journey of the sun both visually and aurally, presenting a symphony of nature and technology. Happily, the opportunity to experience this fantastic solar-powered light and sound installation has been extended. Visitors have until January 2016 to visit the Frieze Sculpture Park, set within the English Gardens of Regent’s Park, for free.